We searched Medline, Clinical Evidence, and the Cochrane Library using the terms “bone metastases”, “pain”, and “bone pain” and then combined these with the specific treatment terms individually. Where possible we have used systematic reviews but not referenced trials included in these reviews. We limited our search from 1990 to December 2014. We also searched the National Institute for Health and Care Excellence and the Scottish Intercollegiate Guidelines Network. In calculating the numbers needed to treat, we have assumed a conservative placebo response of 25%. Given the prevalence of cancer induced bone pain, it is likely that clinicians in primary or secondary care will be confronted by patients in pain crises. Recognising and initiating management of this specific pain state, as well as an awareness of the specialist treatments, is important for all clinicians. What is cancer induced bone pain? Who gets cancer induced bone pain? Cancer induced bone pain can occur anywhere that cancer has metastasised to bone. Cancers most often involved are those of the prostate, breast, and lung, as well as myeloma.3 The most common sites of metastases are vertebrae, pelvis, long bones, and ribs.3 At postmortem examination, up to 70% of patients who died of cancer will have bone metastases.3 Bone metastases can be found in a wide range of places (figure⇓). However, not all patients with bone metastases get pain; bone pain was identified in only a third of patients with bone metastases in one large prospective study.1 It is not yet clear why some bone metastases cause pain and others do not. What are the clinical features of cancer induced bone pain? Cancer induced bone pain is most commonly experienced in the lower back, pelvis, long bones, and ribs. This can be the presenting feature of the cancer or highlight a recurrence in those previously treated. Therefore in patients with or without active cancer, persistent pain in these areas should alert clinicians to the possibility of bone metastases. Findings on examination are often non-specific with only some tenderness over the site of metastasis or pain specifically related to movement. Table 1⇓ outlines the advantages and disadvantages of the various investigations for suspected cancer induced bone pain. Generalists may consider plain film radiography or computed tomography as initial investigations; other investigations are usually undertaken by specialists. How is cancer induced bone pain initially managed? The first steps in management are simple measures that can be initiated in non-specialist care, while referral for specialist treatments such as radiotherapy or bisphosphonates is awaited. In the following section we describe the evidence for each treatment that is commonly used for cancer induced bone pain. Consider specialist referral in any patient where pain persists despite these initial steps, those with rapidly increasing pain despite treatment or evidence of toxicity from opioids, and where pathological fracture or spinal cord compression are suspected. Important aspects of managing cancer induced bone pain are to support patient self management and encourage the use of non-drug measures. An observational study of 1000 European patients with cancer showed that in those who had pain on movement, many of whom had bone metastasis, 43% found consistent pain relief with non-drug measures, often reported as either rest or sleep.6 Discussing behaviour modifications, such as avoiding strenuous movement, and referring patients for any appropriate movement aids (walking stick, Zimmer frame) or home adaptations (bath rails) can make important contributions to the maintenance of function and quality of life. The first step of the WHO ladder is non-opioid analgesics, such as paracetamol and non-steroidal anti-inflammatory drugs. Although some patients find over the counter analgesics helpful, several systematic reviews that have examined the effectiveness of paracetamol for cancer pain showed that although it was well tolerated there was no significant benefit particularly when added to strong opioids.13 14 Non-steroidal anti-inflammatory drugs are often perceived to be more efficacious in cancer induced bone pain than in other pain states, and this is a reasonable assumption given the major inflammatory component. However, a well conducted systematic review in 2012 showed some benefit from adding non-steroidal anti-inflammatory drugs to strong opioids for cancer pain, although this evidence is limited and weak.13 There are well reported concerns regarding adverse effects of non-steroidal anti-inflammatory drugs; however, this systematic review failed to show any additional harm of adding a non-steroidal anti-inflammatory drug to a strong opioid.13 The studies did not perform subgroup analysis on cancer induced bone pain. Therefore the assertion that non-steroidal anti-inflammatory drugs are specifically beneficial in cancer induced bone pain cannot be supported. The next step in the WHO ladder is the use of weak opioids, although a systematic review has only shown marginal benefits of tramadol and codeine in cancer pain, with significant nausea and vomiting associated with tramadol compared with placebo or when added to fentanyl. The authors in these studies did not report the specific proportion of patients with bone metastases.w5 Therefore it is common to miss this step and start low dose strong opioids if non-opioid analgesia is ineffective. Several different preparations and types of strong opioid are available. A network meta-analysis showed no important differences in efficacy between morphine and other strong opioids.17 Based on one well conducted randomised controlled trial, about 75% of patients will achieve good pain control with strong opioids, resulting in a number needed to treat of 2.18 Within this study, however, there was no subgroup analysis for cancer induced bone pain. Table 2⇓ provides a summary of the numbers needed to treat for various treatments for cancer induced bone pain. Management of incident pain is less satisfactory. This is because pain manifests within five minutes, is often movement related, and subsides within 15 minutes in about half of patients with cancer induced bone pain.w4 Timing drug treatment to coincide with this pain profile is challenging. What further treatment options are available? Once initial treatment has been started, further treatment options are available to maintain function and quality of life. Radiotherapy has been shown to reduce pain significantly and is the most effective treatment that is specific for cancer induced bone pain. Therefore patients with confirmed cancer induced bone pain should be referred to a clinical oncologist as soon as possible. A well conducted systematic review comparing single dose radiotherapy with multiple doses found no important differences between treatments. Both approaches resulted in a meaningful improvement in pain for about 60% of patients (number needed to treat 2.8).24 25 Within this group it was reported that approximately 25% would be pain-free. This means that a single dose of radiotherapy can be effective and without major burden for even very frail patients. Bisphosphonates such as pamidronate and zoledronate are used to reduce both pain and skeletal events in patients with bone metastases. They act by inhibiting osteoclast function. Globally they are used to prevent skeletal related events and reduce pain in breast, prostate, and lung cancer as well as multiple myeloma. In the United Kingdom NICE only recommends early treatment with bisphosphonates for bone pain associated with breast cancer.28 NICE advise it can be used in lung and prostate cancer once palliative measures and radiotherapy have been given. Several well conducted randomised controlled trials have shown a persistent reduction in pain scores over years with bisphosphonates in patients with breast cancer, and although pain scores increase over time in studies in prostate cancer there is still a significant difference in favour of bisphosphonate compared with placebo.29 In a large well conducted randomised controlled trial in which patients with bone pain from prostate cancer were randomised to a single infusion of 6 mg of the bisphosphonate ibandronate or a single 8Gy fraction of radiotherapy, overall response rates at four weeks were 49% and 53%, respectively. This non-significant difference was also similar at 12 weeks.30 This suggests that radiotherapy and bisphosphonates are equally appropriate and effective interventions. In patients with a good performance status, prophylactic surgery may be considered for relief of cancer induced bone pain. One randomised controlled trial showed that percutaneous stabilisation in the long bones of leg can significantly reduce pain.w13 Once a pathological fracture has occurred, however, orthopaedic intervention can stabilise the fracture. Complementary therapies may be considered, but as yet they are supported by weak evidence. A Cochrane systematic review of acupuncture acknowledged that there were studies showing benefit in cancer pain, but that evidence was insufficient to recommend this as a treatment.w14 Evidence was also insufficient to support TENS (transcutaneous electrical nerve stimulation), but one small feasibility randomised controlled trial in patients with cancer induced bone pain suggests that verbal rating scores of pain on movement are reduced with active TENS compared with sham TENS.34 w15 Patients may appreciate non-drug measures that they can manage themselves and so TENS may be of value. Why do some bone metastases cause pain and others do not? What are the disease processes that are responsible for some bone metastases causing pain and others not, and are there any associations with cancer type? Are there specific phenotypes of cancer bone pain that might predict response to analgesia? What is the contribution of spinal hyperexcitability in the experience of bone pain, and how best can this be identified and managed? What non-drug treatments may offer patients benefit in managing movement related pain? I was diagnosed with cancer on my wedding anniversary a year ago. I developed back pain, which felt exactly the same as sciatica; however, it wasn’t getting any better. One Saturday it became so unbearable that I went to A and E and they diagnosed a water infection and sent me home with antibiotics. I saw my general practitioner and he sent me back to A and E where they did a scan and told me my kidney looked slightly inflamed. They said it would settle down in a few days with antibiotics. They called me back a few days later to tell me they’d found cancer in the bones in my back and my pelvis on the scan I’d had. Since then the pain has been bad but it’s the things that it stops me from doing that I get upset about. I can’t swim or walk anymore and it really wears you down. It’s affected my marriage so we now sleep in separate beds. I’ve really appreciated the doctors’ help but they don’t understand that I don’t just want to lie in bed all day, because the tablets have made me sleepy. I want to be able to do things and this is so important to me. I’d really like doctors to think about trying to make sure I’m able to do things still rather than just giving me tablets. Contributors: CK conceived, drafted, and revised the paper and interviewed a patient to develop the patient’s story. PH revised the paper and provided tables and images for inclusion. MIB conceived and revised the paper and calculated the numbers needed to treat. All authors approved the final manuscript. MIB is the guarantor. Competing interests: We have read and understood the BMJ policy on declaration of interests and declare the following interests: none. Grond S, Zech D, Diefenbach C, Radbruch L, Lehmann KA Assessment of cancer pain: a prospective evaluation in 2266 cancer patients referred to a pain service. Pain1996;64:107-14. Caraceni A, Portenoy RK. An international survey of cancer pain characteristics and syndromes. IASP Task Force on Cancer Pain. International Association for the Study of Pain. Pain1999;82:263-74. Coleman RE. 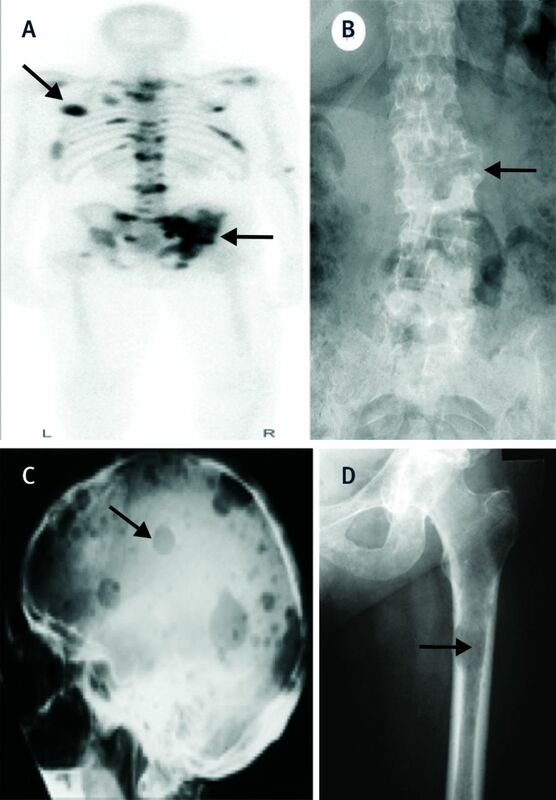 Clinical features of metastatic bone disease and risk of skeletal morbidity. Clin Cancer Res2006;12(20 Pt 2):6243s-49s. Falk S, Dickenson AH. Pain and nociception: mechanisms of cancer-induced bone pain. J Clin Oncol2014;32:1647-54. Middlemiss T, Laird BJ, Fallon MT. Mechanisms of cancer-induced bone pain. Clin Oncol2011;23:387-92. Davies A, Buchanan A, Zeppetella G, Porta-Sales J, Likar R, Weismayr W, et al. Breakthrough cancer pain: an observational study of 1000 European oncology patients. J Pain Symptom Manage2013;46:619-28. White BD, Stirling AJ, Paterson E, Asquith-Coe K, Melder A. Diagnosis and management of patients at risk of or with metastatic spinal cord compression: summary of NICE guidance. BMJ2008;337:a2538. Chaichana KL, Woodworth GF, Sciubba DM, McGirt MJ, Witham TJ, Bydon A, et al Predictors of ambulatory function after decompressive surgery for metastatic epidural spinal cord compression. Neurosurgery2008;62:683-92; discussion 83-92. Brown PD, Stafford SL, Schild SE, Martenson JA, Schiff D. Metastatic spinal cord compression in patients with colorectal cancer. J Neuro-oncol1999;44:175-80. World Health Organization. Cancer pain relief. 2nd ed. WHO, 1996. http://whqlibdoc.who.int/publications/9241544821.pdf. Zech DF, Grond S, Lynch J, Hertel D, Lehmann KA. Validation of World Health Organization guidelines for cancer pain relief: a 10-year prospective study. Pain1995;63:65-76. Bennet MI. What evidence do we have that the WHO analgesic ladder is effective in cancer pain? In: McQuay HJ, Moore R, Kalso E, eds. Systematic reviews in pain research; methodology refined. IASP Press, 2008. Nabal M, Librada S, Redondo MJ, Pigni A, Brunelli C, Caraceni A. The role of paracetamol and nonsteroidal anti-inflammatory drugs in addition to WHO Step III opioids in the control of pain in advanced cancer. A systematic review of the literature. Palliat Med2012;26:305-12. McNicol E, Strassels SA, Goudas L, Lau J, Carr DB. NSAIDS or paracetamol, alone or combined with opioids, for cancer pain. Cochrane Database Syst Rev2005;1:CD005180. Bennett MI, Graham J, Schmidt-Hansen M, Prettyjohns M Arnold S. Prescribing strong opioids for pain in adult palliative care: summary of NICE guidance. BMJ2012;344:e2806. Klepstad P, Kaasa S, Jystad A, Hval B, Borchgrevink PC. Immediate- or sustained-release morphine for dose finding during start of morphine to cancer patients: a randomized, double-blind trial. Pain2003;101:193-8. National Institute for Health and Care Excellence. Opioids in palliative care. (Glinical guideline 140.) 2012. www.nice.org.uk/cg140. Riley J, Branford R, Droney J, Gretton S, Sato H, Kennett A, et al. Morphine or oxycodone for cancer-related pain? A randomized, open-label, controlled trial. J Pain Sympt Manage2014; published online 26 Jun. doi: 10.1016/j.jpainsymman.2014.05.021. Jandhyala R, Fullarton JR, Bennett MI. Efficacy of rapid-onset oral fentanyl formulations vs. oral morphine for cancer-related breakthrough pain: a meta-analysis of comparative trials. J Pain Sympt Manage2013;46:573-80. Davis MP. Efficacy of rapid-onset oral fentanyl: what does it mean? J Pain Sympt Manage2014;48:e2-3. Bennett MI. Effectiveness of antiepileptic or antidepressant drugs when added to opioids for cancer pain: systematic review. Palliat Med2011;25:553-9. Yennurajalingam S, Frisbee-Hume S, Palmer JL, Delgado-Guay MO, Bull J, Phan AT, et al. Reduction of cancer-related fatigue with dexamethasone: a double-blind, randomized, placebo-controlled trial in patients with advanced cancer. J Clin Oncol2013;31:3076-82. Paulsen O, Klepstad P, Rosland JH, Aass N, Albert E, Fayers P, et al. Efficacy of methylprednisolone on pain, fatigue, and appetite loss in patients with advanced cancer using opioids: a randomized, placebo-controlled, double-blind trial. J Clin Oncol2014;32:3221-8. Dennis K, Makhani L, Zeng L, Lam H, Chow E. Single fraction conventional external beam radiation therapy for bone metastases: a systematic review of randomised controlled trials. Radiother Oncol2013;106:5-14. Chow E, Zeng L, Salvo N, Dennis K, Tsao M, Lutz S. Update on the systematic review of palliative radiotherapy trials for bone metastases. Clin Oncol2012;24:112-24. Chow E, Meyer RM, Chen BE, van der Linden YM, Roos D, Hartsell WF, et al. Impact of reirradiation of painful osseous metastases on quality of life and function: a secondary analysis of the NCIC CTG SC.20 randomized trial. J Clin Oncol2014; published online 27 Oct.
Chow E, van der Linden YM, Roos D, Hartsell WF, Hoskin P, Wu JS et al. Single versus multiple fractions of repeat radiation for painful bone metastases: a randomised, controlled, non-inferiority trial. Lancet Oncol 2014;15:164-71. National Institute for Health and Care Excellence Advancerd breast cancer. (Clinical guideline 81). 2014. www.nice.org.uk/guidance/cg81. Gralow J, Tripathy D. Managing metastatic bone pain: the role of bisphosphonates. J Pain Sympt Manage2007;33:462-72. Hoskin P, Sundar S, Reczko K, Forsyth S, Mithal N, Sizer B et al. A Multicentre Randomised Trial of Ibandronate Compared to Single Dose Radiotherapy for Localised Metastatic Bone Pain in Prostate Cancer (RIB). Eur J Cancer2011;47:6. Wong R, Wiffen PJ. Bisphosphonates for the relief of pain secondary to bone metastases. Cochrane Database Syst Rev2002;2:CD002068. Mhaskar R, Redzepovic J, Wheatley K, Clark OA, Miladinovic B, Glasmacher A, et al. Bisphosphonates in multiple myeloma: a network meta-analysis. Cochrane Database Syst Rev2012;5:CD003188. Stopeck AT, Lipton A, Body JJ, et al. Denosumab compared with zoledronic acid for the treatment of bone metastases in patients with advanced breast cancer: a randomized, double-blind study. J Clin Oncol2010;28:5132-9. Hurlow A, Bennett MI, Robb KA, Johnson MI, Simpson KH, Oxberry SG Transcutaneous electric nerve stimulation (TENS) for cancer pain in adults. Cochrane Database Syst Rev2012;3:CD006276.